The deadly attack that had killed the Egyptian Prosecutor General Hisham Barakat has thrown Egypt into a panic and, few hours later, a wave of attacks by jihadists has overwhelmed the northern Sinai. The province is located on the Egyptian coast, near the border between Egypt, Gaza and Israel. A strategic area from the geopolitical point of view, but also the geographical centre of the empire that Isis would want to rebuild, which is the first Islamic Umayyad Caliphate (661-750 A.D.) from Spain to India, a vast territory divided by the Treaty of Sykes-Picot. Car bombs and kamikazes have destroyed checkpoints and police stations in the town of Sheikh Zuweid, on the west side of Rafah. This is the biggest attack ever in the province of Sinai, an episode that brings back memories of the attack on the Sinai of the 1973, during the Yom Kippur War against Israel. A killing claimed by the terrorist group Ansar Beit al-Maqdis fighting against the army of Egyptian President Abdel Fattah al-Sisi. The terrorist group has abandoned al-Qaeda and vowed allegiance to ISIS, in exchange for financial aid. It is not only the terrible Isis to worry the Arab regimes that try to define their participation in the American coalition anti-Isis. As matter of the fact, the proliferation of radical groups that see in the Islamic State a model and a reference point intimidates the Arab States. Anyway, the Egyptian President Abdel Fattah al-Sisi is fighting a very tough campaign against the Islamists. In the last two years, the Egyptian regime arrested and sentenced to death dozens of members of the political movement of the Muslim Brotherhood, including the former President Mohammed Morsi ousted in June of 2013 by a coup. In the aftermath of the overthrow of Morsi, the Islamist militias of Ansar Beit have become more active and inaugurated a series of attacks in the Sinai in 2014 and 2015, but this time the aggravating element is not only the choice of the group to be part of the Islamic State, is the territorial proximity to Israel as well. ISIS in the Egyptian desert is a serious danger for the national security of the Jewish State, which decided to close its borders to Nitzana and Kerem Shalom, near Rafah, and prevent the infiltration of men of Al Baghdadi. At least, for the moment. According to some sources, it seems Al-Sisi is contemplating the possibility of asking for help from Tel Aviv, because the Israeli army could contrast the likely expansion jihadist in the northern Sinai. 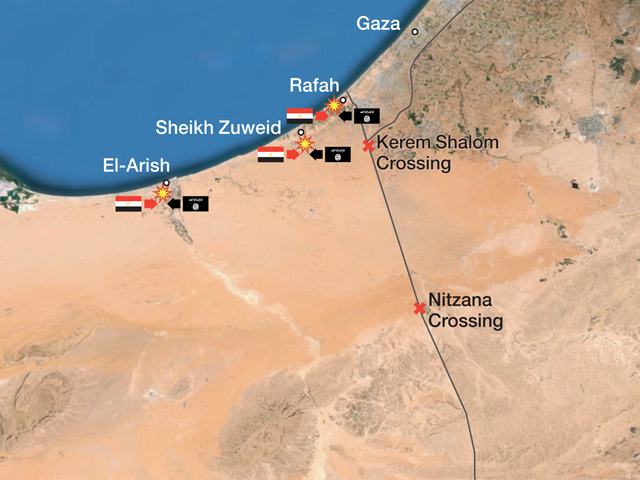 After the bloody attack last January, the Egyptian army has reached a relative calm in the centre and south of the Sinai. The problem persists in northern Sinai. However, it can be assumed that, despite the terrorist attacks in the Sinai, al-Sisi’s resolve will not weaken Egypt and his regime will continue in its war against terrorism, although the fight against terrorism has no immediately solution. Egypt is not able to rely solely on its own strength, but an Arab State that turns to Israel is the paradox par excellence, a historical contradiction that could definitely trigger the wrath of Muslims. The attacks are a tangible signal of the inability of the Egyptian government to prevent the advance of jihadists. This raises difficult questions about the ability of the Egyptian army and, among the most important problem, the risk that ISIS could try to spread their attacks against Israel. It will be interesting in seeing how the situation in the Sinai will affect the relations between Egypt and Hamas. The Salafist infiltration and the Islamic State in the hottest part of the Sinai is a pressing issue for Hamas. We can imagine a scenario in which in addition to rescue Egypt, Israel must also intervene in favour of his old enemy. The threats of the Islamic State in Israel and Gaza come in a delicate moment for the balance of the Israeli-Palestinian. The consent of Hamas is declining in the Strip, its role in the government of national unity has been challenged by Fatah, the party of Abbas. The Islamic State could take advantage of the crisis of leadership and hope that reigns in the Palestinian territories. According to some information, the terrorists in Gaza have found a new partner in the new government of the Right of Tel Aviv. Hamas and Israel could negotiate for a ten-year truce between the parties against Isis. It is not excluded that among the attackers there were also Palestinian. Rocket launchers used against Egyptian Apaches were the same used in Gaza against Israeli forces. Weapons that cross the tunnel, which evidently continue to operate. Among the weapons used, many also came from the arsenal of Gaddafi. This means that the militias of the Islamic State crossed undisturbed Egypt to arrive in Libya. The jihadist tactics plan to exploit the absence of controls along subsides, strategically undervalued, to access in these territories. 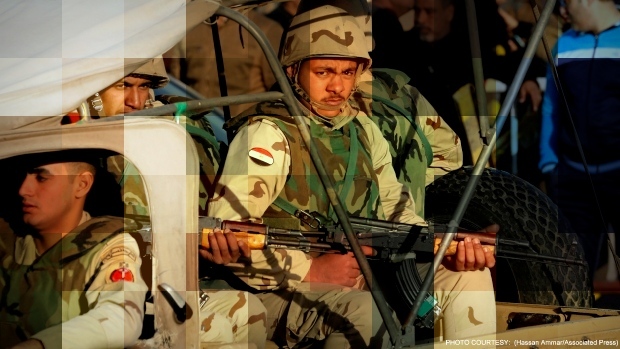 Egypt has raised the security alert in the most sensitive areas of the country. A security cordon has been established in front of the Constitutional Court in Cairo, measures at the highest levels have also been prepared in the Suez Canal, the gateway to the Mediterranean. The conquest of the channel for the Islamic State would be a life insurance for the terrorist group.